Product prices and availability are accurate as of 2019-04-11 17:18:59 EDT and are subject to change. Any price and availability information displayed on http://www.amazon.com/ at the time of purchase will apply to the purchase of this product. 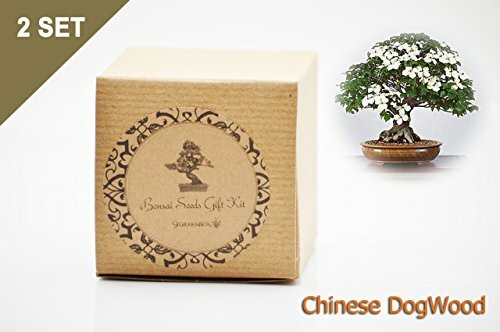 Good Gift ideal for everyone want to watch their own bonsai grow from seeds. Good education and learning experience. The Dogwood species range anywhere from groundcover, multi branched shrub or tree, or a single trunk ornamental tree form. Dogwood trees are considered by many as the best all-round flowering trees. Dogwoods are most known for their outstanding display of flowers in the spring. Cornus kousa, also known as Kousa dogwood, Japanese dogwood, or Chinese dogwood, is a small, handsome specimen tree or shrub. This handsome little tree adds year-round beauty, for white flowers in May and June give a Milky Way effect, while purple and scarlet fall leaves add intense color. The beautiful tree form has horizontal branching. It is planted as a specimen, near a patio, or in groupings. The Kousa is not as susceptible to disease as the white dogwood in spring. Blooms later and with a softer-petaled flower than the white flowering dogwood. Because of its disease resistance, it is becoming the best replacement for the white dogwood. Kousa Dogwood has low water requirements and displays a moderate tolerance for salt and alkali soils. Partial shade to full sun. Grows to 15' to 25', 25' spread. Hardy in zones 5-8. In groupings plant 10-15' apart. Does not deliver on Saturday, Sunday or Monday. 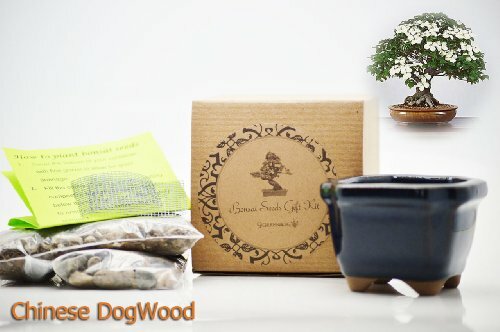 Complete Bonsai Seed Kit with everything you need to grow Chinese DogWood Bonsai from seed Style and color of ceramic container may vary, Ceramic Vase measures 2.75"L x 2.75"W x 2"H Kit includes enough seeds to germinate several starter plants Seed kit includes Chinese DogWood Bonsai Seeds, Ceramic Vase,Bonsai Potting Mix, Pebbles, and Instruction Guide. IT WILL ARRIVE IN 2 SET.